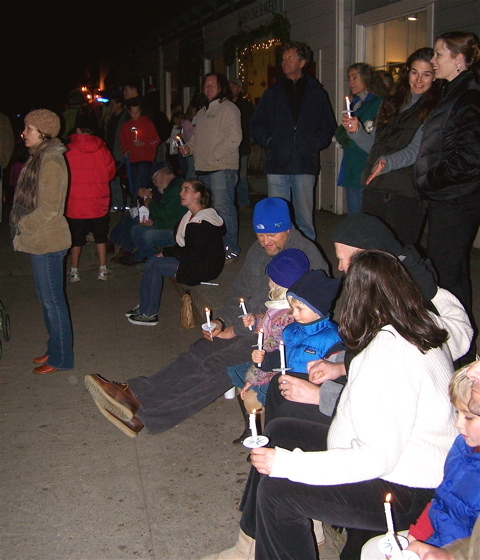 Point Reyes Station merchants held their 10th annual Path of Lights Friday, culminating in the lighting of the town Christmas tree. The tree is on the main street between the parking lots of the Bank of Petaluma and the Palace Market. 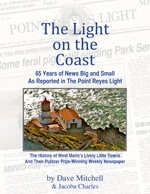 Sponsoring the event were the West Marin Chamber of Commerce, Point Reyes Books, Rotary Club of West Marin, Point Reyes Surf Shop, and Bank of Petaluma. 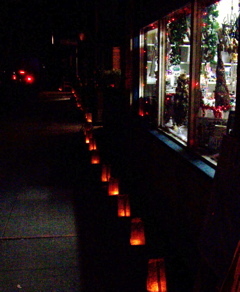 Most retail merchants in Point Reyes Station took part and as always placed luminaria in front of their businesses. 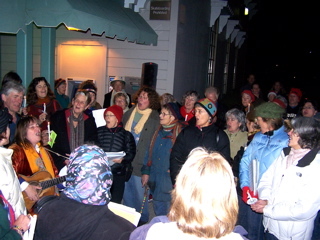 Playing her guitar in front of the Bank of Petaluma, singer Harmony Grisman of Inverness led caroling at the West Marin Senior Services tree-lighting ceremony. Breezes were light enough that candles could be kept lit by the crowd gathered in front of the Point Reyes Emporium Building across the street from the carolers and the town Christmas tree. Other events Friday evening included Santa Claus’ arriving to a yuletide gala at Toby’s Feed Barn and the annual Dance Palace Craft Fair, which continued on Saturday and Sunday. In addition, numerous merchants held a scavenger hunt and drawing. Aquí in Taos, New Mexico, and also in Santa Fe, the term luminaria refers to bonfires, and farolitos are the candles in the paper bags. 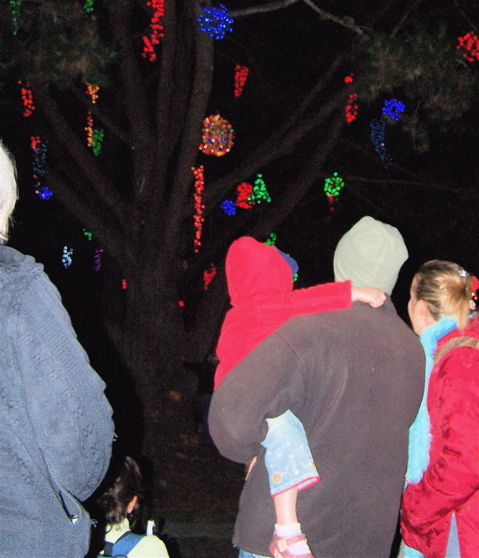 In Albuquerque, luminaria does refer to the little candle bags. As a convenience, there are now electrified plastic bags locally referred to as bagolitos.